Chances are you’re always looking for new ways to save money on operating costs and increase your bottom line. 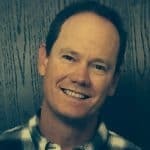 You’ve looked at where you can get the most affordable materials and where your facility has excess or waste, but there still might be one more place where you’re losing money: paying an outside company to dispose of your used absorbent materials. Now you can burn that cost — literally! 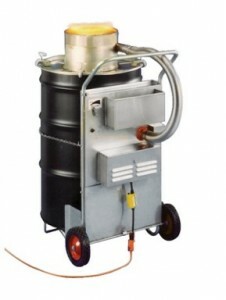 — with a new, industry-changing product: the SmartAsh portable incinerator. You’re already spending money paying someone to safely dispose of your used absorbents. What if you could do all of that internally? Cut your waste disposal costs in the long term by enabling your facility — or even remote locations, as SmartAsh is portable — to incinerate your own used absorbents. 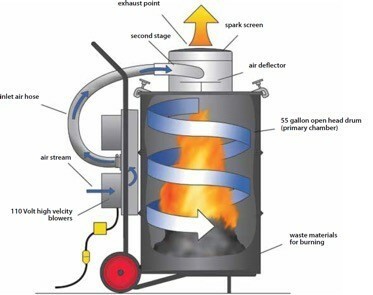 This portable, self-contained incinerator, approved by the Environmental Protection Agency (EPA), can dispose of any non-hazardous material, saving you money after a spill or day-to-day on drips and messes. It is effective in incinerating soiled absorbents, paper waste, filters, wood, waste oil, food waste, oily rags, and organic material. Bonus: It even eliminates the second-person-contamination liability problem. Not only will SmartAsh save you money, it’s also easy to use. Simply load any 55-gallon, open-head steel drum three-fourths of the way full with non-hazardous waste, light it, and attach the incinerator to the top of the open-head steel drum. A whirlwind of fire and intense heat is created inside the drum by the unit. As a result of that intense heat, the waste inside the drum is reduced to 3% ash — without smoke or odor! Quality American Welding Standard (AWS) welding holds the heavy-duty, machine-spun, 304-stainless-steel lid and assembly together on this incinerator. An elevated stand protects the floor from the heat the unit creates, and the internal manual shutter valve allows fine-tuned adjustment of airflow, offering complete control over incineration. The motor covers are easy to remove, allowing for easy maintenance and quick access to air filters. The SmartAsh boasts a 330-stainless-steel spark screen, galvanized plenum and toolbox, cast iron stir port cover, and a stainless-steel, air-feed hose with quick couplers. Four fast-locking barrel clamps provide a sturdy grip, and the booted toggle switch is weatherproof. The wheels feature brass bearings. Need a no-voltage or low-voltage shutdown? The automatic kill switch makes it easy. The electric cord is rear-mounted and shielded, and the handle and wheels are shielded as well. If you’re looking for another place to save some money in your facility, consider taking care of your waste disposal internally with the SmartAsh! Are you interested in finding more ways to burn costs at your facilities? To find out how, contact Angie Meza at angie@absorbentsonline.com or (800) 869-9633.